small convenience stores to high-end retail ATM locations. Eye-catching, customizable color LED lighting around the keypad attracts more users to drive additional transactions and revenue to your bottom line. The Nautilus Hyosung intuitive application interface is presented on a vivid 10.1-inch LCD screen, and all user touch points (screen interface, keypad and cash exit) are positioned for optimal visibility and access. The NH-2700CE is the most advanced, next generation ATM for the retail market. The NH-2700CE features elegant lines allowing it to blend in seamlessly in any location. The 2700′s a highly advanced user interface and graphics enhance the design and give the ATM the capability to stream news and weather updates, change backgrounds, and display advertisements. The optional LED topper or LCD topper provide powerful advertising opportunities as well. The new ARM v7 Cortex a8 CPU offers powerful data processing to allow multitasking, networking. The available security pack including a thermal and vibration sensors and a local siren ensure that your ATM is safe, as does the enhanced safe door and locking mechanism.A UL buiness-hour safe and PCI EPP (Encrypting PIN pad) provide a secure transaction enviroment. For enhanced security, choose an option electronic or KABA Mas Cenconsafe lock. The MX 5200SE is the Most Flexible Solution for High-Volume, High-Value Transactions. Monimax 5100T(NH-5040) can be upgraded with additional features and security: Monimax 5100T provides optional modules such as sunlight viewable LCD display, maximum 4 cassettes, electronic or cencon lock and 5.7″ supervisor display. 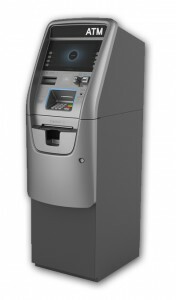 Monimax 5100T ensures the complete security for the cardholder and financial institution with triple DES EPP, UL291 business hours and optional UL291 level 1 safe, and voice guidance system to meet ADA requirements.The optional remote monitoring system provides highly efficient management functions and true real time monitoring. Monimax 5100T fits all ATM applications; walk-up and drive-up, kiosk and through-the-wall, on-premise and off-premise.It gives you true flexibility! Built on the Windows open platform,it can deliver multi-media advertisements and decrease transaction time. Thanks to its scalable hardware and software, advanced services and functions can be easily added. Its 10.4″ sunlight viewable color display supports perfect operation under any exterior environment. Compact architecture and small footprint make installation simple and maintenance easy. Any application software based on WOSA/XFS platform can be easily applied.